PG Hospital Contact Number with some important details is compiled. PG hospital is mainly the “Institute of Postgraduate Medicine and Research (IPGMR)” and currently formed as the Bangabandhu Sheikh Mujib Medical University (BSMMU). This is the single public medical university in Bangladesh was established in 1998 that offers the courses of MD, MS, PhD, M Phil, Diploma, MDS, and FCPS. After of 2010, a huge quantity of medical colleges and institutes are affiliated to the BSMMU, including DMC, BIRDEM, NICVD, NITOR, BIHS and others. Many foreign students study at the university, including Nepal, Bhutan and other countries. 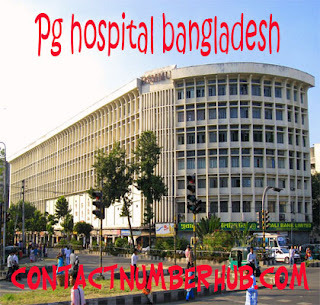 PG Hospital has made its position as one of the best medical institutes in Bangladesh. The government of Bangladesh took the vital initiative to convert IPGMR as a Medical University to extend the higher medical study and research in the country. It got quick reputation within a short period of time providing various post graduate courses. The administrative office working hours are from 8 am to 2:30 pm except Fridays and government holidays. Some of the out patients services are including Pediatrics & Neonates, skin diseases, dentistry, Obstetrics and gynecology, plastic surgery, orthopedics, surgery, endocrinology, nephrology, cardiology, gastroenterology, psychology, neurology, internal medicine etc. Moreover, it has the highest amount of faculties and departments among the Bangladeshi medical institutes, including Faculty of Medicine, Faculty of Surgery, Faculty of Dentistry with the departments of Oncology, Psychiatry, Rheumatology, Neuro-Surgery, Orthopedics Surgery, Anesthesiology, Urology, Radiology and Imaging, Oral and Maxillofacial Surgery, Pathology, Laboratory Medicine, Anatomy etc. BSMMU offers admission for the courses of the post graduate like MS, MD, and M. Phil etc. The candidate must be a Bangladeshi citizen with 50% in B.Sc. programs. SAARC students are allowed to admit in it with eligibility. They must show their legal migration certificates before admission. There are no hostel facilities for the students of the BSMMU.